What do you do in a foreign country where your community barely totals 60 families, and you want to cling on desperately to your religious and cultural traditions? What can you do to ensure your barely visible community doesn’t suffer haemorrhage and dies? Indeed, in what way can a Parsi in Paris hope to survive the sweeping global culture and the influence of the West and stave off extinction? Not much, you’d say, just pray and hope for the best. Kersi migrated to France four years ago, preferring the romantic city of Paris to the US where he had superannuated as an engineer. He and his family have dedicated themselves to preserving Parsi heritage and explaining the religion to the new generation brought up in a land culturally rather distant from theirs. But Kersi faces several impediments in this endeavour of his. “I know all the prayers by heart. But when my children or other younger people ask me what that means, I really have no idea since the prayers are in Avestan (ancient Persian), a language that few people around the world speak. But if I can’t understand Avestan, how can I convince the younger generation about our religious heritage,” he laments. This is an acute problem for the community which isn’t particularly young. Parsis in France are basically of two types—those young professionals who came here in pursuit of their careers, and those who are descendants of families settled here in the first decade of the last century. There’s an obvious limitation in reading scriptures and offering prayers by rote, unintelligible and incomprehensible. It definitely isn’t the most effective way of inculcating in the younger generation a deep and abiding love for their much-exiled heritage. This is precisely what prompted Kersi recently to travel down to Bombay and visit the Cama Arusthana Institute, the only organisation in the world to train Dastoors, or Parsi priests. “Over there I found some books on teaching Avestan. I have bought some and am learning the language now, so that I can later teach the younger generation as well,” he says in a voice full of hope rather than conviction. The challenge the Kapadias are countering in Paris had been countenanced earlier by those who had arrived here at the turn of the century, lured by the country’s lifestyle and business opportunities. Among the most prominent were the Tatas—its modern icon JRD was born in Paris in 1904, and spent his childhood here in the care of his French mother, Sooni. Subsequently, he’d often come down to Paris where in its famous cemetery Pere LaChaise lay buried JRD’s ancestors, including his father and mother. It’s here JRD’s ashes too are entombed. Yet another prominent Parsi to have lived in Paris was Bhikhaji Cama, who’s credited to have designed the Indian flag. Cama fled London for Paris in 1920, dodging the British police which wanted to arrest her for her links with the freedom movement. But the biggest wave of Parsi migration from India to France came around 1910. Then a motley group of Jain and Parsi jewellers from Bombay arrived in Paris, hoping to tap the market for natural pearls. Among them was Dhanjishah Cooper. Since conservative Hindus didn’t want to flout the caste taboo on travelling overseas, a leading Bombay jeweller commissioned Cooper to explore business opportunities here. Cooper established his business of pearls in Paris in 1910, joined subsequently by his brother Shavak Sohrabji. Their business flourished; another brother too joined them. “Thus the Cooper family began its foundations in Paris,” says Shavak’s daughter Rati Cooper. Soon, there were about 30 Parsi families in Paris, most of them choosing to settle down in the ninth arrondissement (district) of the metropolis. Every evening, after business hours, the group would gather for a few drinks at the famous Cafe #de la Paix in the locality. In the absence of a priest in Paris, Cooper took his daughters all the way down to Bombay to perform their navjyot ceremony. Rati still has vivid memories of the occasion: “This was our first trip to India. We had so far not seen anyone from our extended family and they were all there at the airport to receive us. There must have been more than 50 people, with garlands, waiting for us.” But Cooper’s fervour wasn’t confined to his family alone. He tried to keep his domiciled community united, celebrating both the Zoroastrian and Hindu festivals together. The advent of artificial pearls three decades ago did undermine the Parsi business but the community had already diversified into other professions. And, practically, almost all tried to keep the Parsi tradition alive. Some, though, were luckier than others, managing to spend time in India and learning about their community. Take famous painter and sculptor Jehangir Bhownagary, whose early schooling was in Paris where he lived with his French mother. But holidays were often in Bombay, and it enabled him to discover his roots. Recalls the octogenarian painter: “I had to often wait for my father in the car, outside his office. Just opposite there was an agiary (fire temple). I began going in there and that is when I learnt about my religion and what it really felt like to be a Parsi.” And that education he had 50 years ago has come in very handy. “Despite having spent so much time outside India and away from my culture, I feel very much a Parsi. I have followed the traditions and tried to bring up our children according to the Parsi tradition,” says Bhownagary, who has done stints as a deputy director of the UNESCO and was also an advisor to Indira Gandhi. For the navjyot of his two daughters, Bhownagary had a priest travel all the way from London to conduct the ceremonies. “That’s a big lacuna in our community, that we don’t have a priest in Paris. For every religious occasion, we have to bring a priest over from London or elsewhere,” he laments. 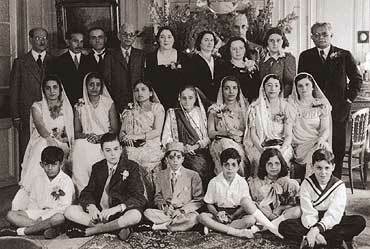 This apart, the other big problem the Parsis in Paris face, as do their brethren in Bombay, is to decide whether or not to admit children of mixed parentage into the community.With the younger generation less rooted in religion, and with more and more of them choosing partners outside the community, the Parsis find it difficult to arrest their declining population, and this adds to the besieged feeling. Says 17-year-old Farrokh Kapadia, Katayun’s son, who is studying to be a submarine officer in the US navy: “The first Parsis were surely converts from other religions. So, if you could accept conversions at the beginning of the religion, why not now? We have to be more liberal if we want to preserve our community.” But this doesn’t mean Farrokh isn’t conscious of a certain sense of obligation. “I would be very keen to pass my religion to my children and it would also play a role in the selection of my future wife,” he says. What the community lacks today the most is a place of religious significance in or around Paris. “If we had a place like an agiary, it would have gone a long way in building up the community and helping the young people understand and develop an affinity towards the religion. Once you have such a place, people come and gather there regularly; religion then becomes the centre of gravity there. We saw the same thing happen in the US where once we had such gathering places, people began to turn up in strength and with their children who became interested in the religion,” says Kersi. Yet another issue before the Parsis in Paris is how to deal with the large population of co-religionists from Iran. There are over 2,000 Zoroastrians from Iran, who are also part of the AZF, but the relationship between them and Indian Parsis remain ambivalent. “While it is very important for us to be together since it significantly enhances our numbers, the problem is that there is little in common between us and the Iranians. Their language is different, their culture, the way they dress, everything is different,” says Katayun. Nearly a century after they settled down in France, and with the fourth generation coming into its own, it is indeed ironical to find the community grappling with the same problems that their ancestors had faced—of how not to forget their roots and keep alive their tradition. Parsis and Iranian Zoroastrians have their religion in common which is why both communities left Iran where our ancestors were persecuted. Iranians have to learn French language just as Parsis do, so they can communicate in French. And, we all eat at various restaurants, so learning to enjoy each other’s food types should not be an obstance to getting together either. Also, nowadays a lot of religious books and prayers are online at website http://www.avesta.org so those interested can learn to do ritual prayers also locally. Nowadays, we have lots of religious books with translations online on the website http://www.avesta.org that anyone with an internet connection can access and download whatever prayers, translations, etc. they need.